Is there any way to change the sender from JotForm to my company name? Were you referring to the E-mail Validator widget? It used to have the custom option before... I am not sure why it was removed by our dev team. Sorry for the confusion. I will elevate this to our higher team support and ask them what happened to the custom options. We will notify you here once we have update on this. 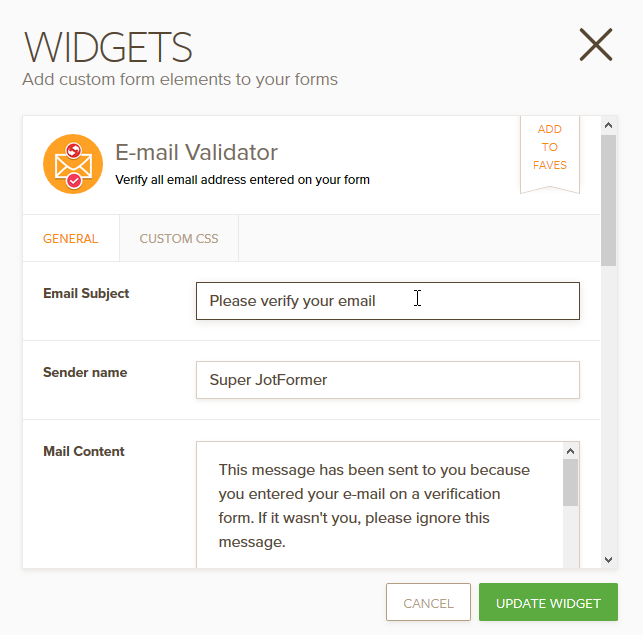 Unfortunately the custom options/feature was removed from the E-mail Validator widget. So it is not possible to have custom sender as the verifier. It will only work with JotForm as the default sender every time. The custom option was removed because it has issue with email services. If it uses a custom sender but the email was still being sent via JotForm, there is higher chance the email sending will fail. Because email services will blocked it for being detected as spoof or fake email only.